Blogs are about sharing pleasure; you give some away; it multiples. Today's is a quiz. While quizzes can raise anxiety, they also can be reconceptualized as low hanging fruit (readily accessible, nourishing, and sweet): quick and easy paths to feeling good and totally alive. Quizzes are sources of potential reward exclusive to those who occupy the cognitive niche. Homo sapiens is generously rewarded by Evolution not just for finding, which usually involves serotonin at the neural level and experientially, the end of wanting at least for a moment; but we are also rewarded with a complex network of good feelings just for seeking. When we seek something, we feel vitalized, and that feels good; sometimes we feel like we are on the right path, feels good; sometimes we have inklings, feels good; sometimes we have insight, feels sublime! The neurochemical circuitry responsible for this motivational suite, called the seeking system (J Panksepp), is further characterized by runaway qualities, meaning that the more we seek, the more vibrant we feel, the more we want to keep on feeling that good. This complex of drives to explore, understand, and to understand is complemented by a network of social drives: the need to show and share that we know; the need to be right; and not least of all, the need to do the right thing. The next few quiz posts are aimed at increasing understanding of how ecosystems work with the longer term umbrella goal of making ecological choices more fun. Like the first three posts, this post is contextualized for the greater Santa Barbara ecosystem, from Point Concepcion to the north, south past Ventura, inland past Santa Ynez, and seaward just past the California current. Which of the organisms in the row below is the most evolved? Whose gonads fetch the highest price worldwide? Row 1; Most evolved is the middle image, the scorpion fish, a family of stoic faced, improbable fish that includes stone fish and lion fish, all masters of camouflage, some beautiful, but all venomous. The first image is the hag fish, the third is a white sturgeon. 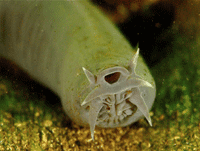 Neither has evolved much over the past several 200 million years or so. The stone and scorpion fish family has developed diabolical abilities to become indistinguishable from their environments to avoid predators and ambush prey. Row 2: The gonads of red sea urchin fetch the highest price. Gold Santa Barbara uni commands about $18/tray, which is just under half a pound. 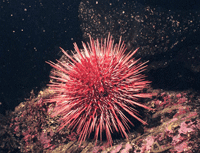 Sea urchin gonads constitute the second largest fishery in California, after market squid. 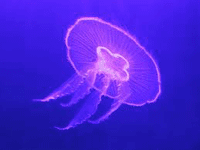 The gonads of the moon jellyfish, are used as an identity marker, but have little if any market value. 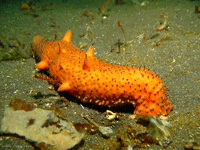 The warty sea cucumber is harvested for marketing in Asia, after considerable preparation, but gonads have no special value. Read more about uni and the ecological sustainability in a previous post about recommended local delicacies and the Santa Barbara Red Sea Urchin Industry. Does eating oysters increase global pleasure?